Red Rose is among the most cherished flowers all across the world. It symbolizes the passion & longing and expresses the deepest feeling with love and clarity. Our collection of Floral Series includes Red Rose Incense Sticks that are used during variety of rituals and for defying bad odor. These Incense Sticks preserve the natural aroma of Red Rose, and thus when burnt, release red rose fragrance which enchants all. We have made these red rose fragrance incense sticks ensuring international parameters of quality and norms and have also tested effects during consistent inhaling of their smoke. 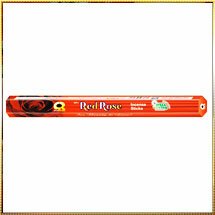 These red rose scented incense sticks are long in size that ensure consistent fuming for hours. Our Incense Stick are popular for offering fragrance that gives a sneak to the paradise on earth. Our red rose based incense sticks are prepared from the selected red rose and its essential oil which assure a fragrance that is soothing and lingers for long. Furthermore, we provide Incense Sticks in attractive packaging imprinted with catchy designs. Our red rose flavored incense sticks are available at the most discounted prices in the industry.